On December 2, 2017, the Senate passed its version of sweeping tax reform legislation, the Tax Cuts and Jobs Act (H.R. 1), by a narrow 51-49 vote. We previously issued alerts summarizing and comparing the House and Senate versions of the tax bill. While not reflected in our alert, the final Senate bill differs significantly when compared to the initial version introduced by the Senate Finance Committee. Next steps in the legislative process will involve both the House and Senate working together to reconcile the differences between both versions of the legislation. Once that process is complete, either the House and Senate will vote on a revised bill, or the House will approve the legislation as passed by the Senate. It appears likely that final legislation will be enacted before the end of 2017. 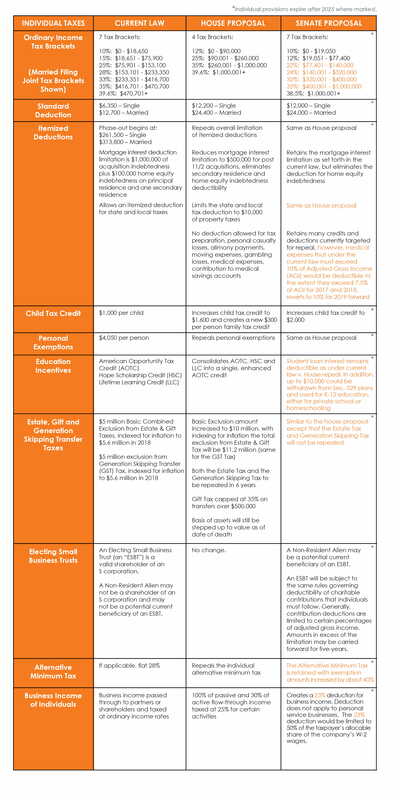 The below charts, while not exhaustive, provide an overview and comparison of current law, the House tax reform bill, and the Senate tax reform bill as it stands currently. 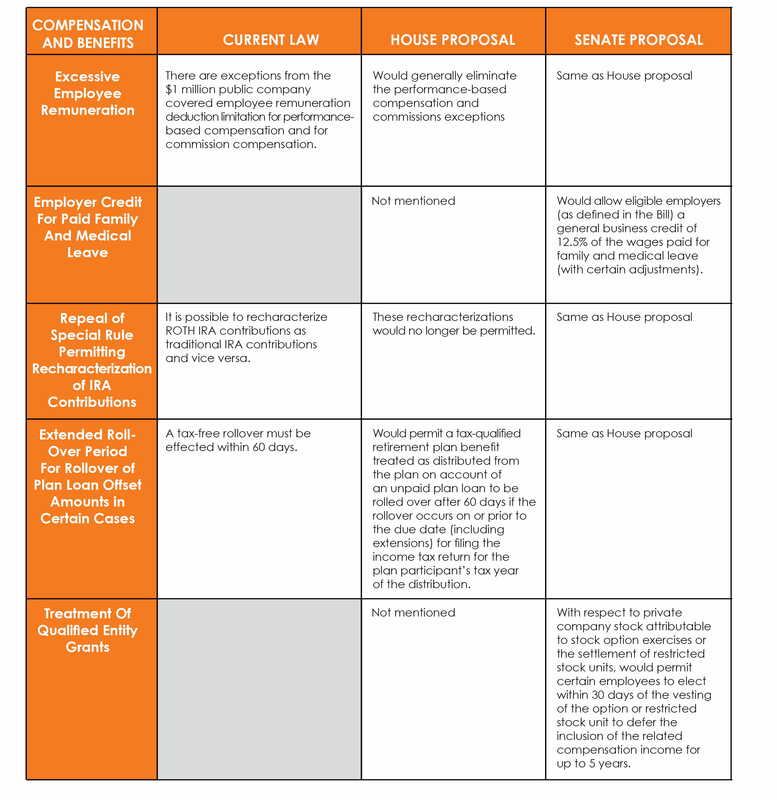 The comments in orange text reflect changes made in the December 2nd Senate bill. We are closely monitoring the latest tax reform developments and will provide updates as they become available. On November 9, 2017, the House Ways and Means Committee voted on the final amendments to its tax reform bill, the Tax Cuts and Jobs Act (H.R. 1). On the same day, Senate Finance Committee Chairman Orrin Hatch (R-UT) released a summary of the Senate GOP’s version of the Tax Cuts and Jobs Act. On November 15, 2017, the Senate Committee on Finance released a list of proposed changes to the original Senate Tax Reform Proposal. The tweaks by Senate Finance Committee Chairman Orrin Hatch, R-Utah, largely move to make the bill comply with Senate budget rules. One change of note is the insertion of a provision to eliminate the Affordable Care Act individual shared responsibility payment (personal insurance mandate) for post-December 31, 2018. The House and Senate versions of the bill have several similar provisions, but there are some significant differences. 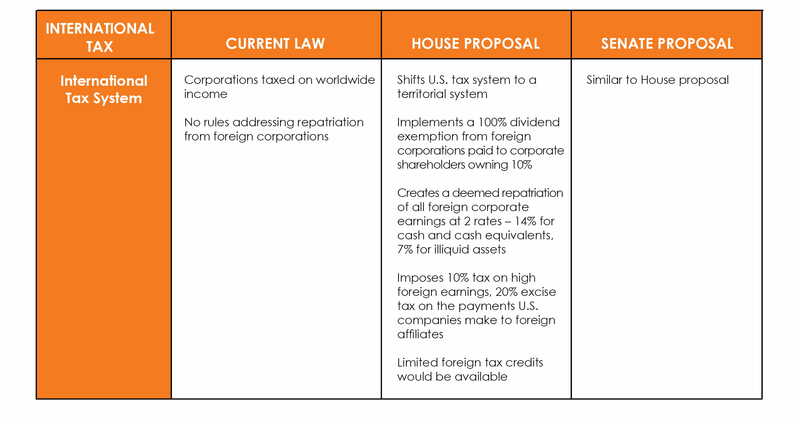 Both versions would move the United States from a worldwide tax regime to a territorial system, reduce corporate income tax rates, eliminate the corporate and individual alternative minimum taxes, increase the standard deduction, and expand child tax credits. Differences include the rules relating to the mortgage interest deduction, IRC Section 179 deduction, and the Estate Tax. There are many steps that need to happen between now and when any version of tax reform becomes law. Taxpayers should continue to monitor the progress in both the House and the Senate to ensure they understand how the proposed rules would impact their position. To negotiate the differences between the House and Senate versions of the bill, Republican leaders have appointed conferees. House Speaker Paul Ryan has named the following House conferees: Conference Chair, Chairman Kevin Brady, and Representatives Devin Nunes, Peter Roskam, Diane Black, and Kristi Noem. The Senate is set to announce its conferees soon. Senate conferees will most likely be Senators Orrin Hatch, Mike Enzi, Lisa Murkowski, Pat Toomey, John Thune, and Rob Portman. CohnReznick will continue to monitor the tax reform process and release timely updates as more information becomes available. For more information, please contact Bob Moss, Principal, Director of Governmental Affairs, at Bob.Moss@CohnReznick.com or 617-648-1406 or Richard Shevak, Principal, National Tax Services, at Richard.Shevak@CohnReznick.com or 862-245-5029.